Johannes Haerteis and José Hernandez-Fernandez fight their way into the second round of the ATP Challenger 80 indoor event. 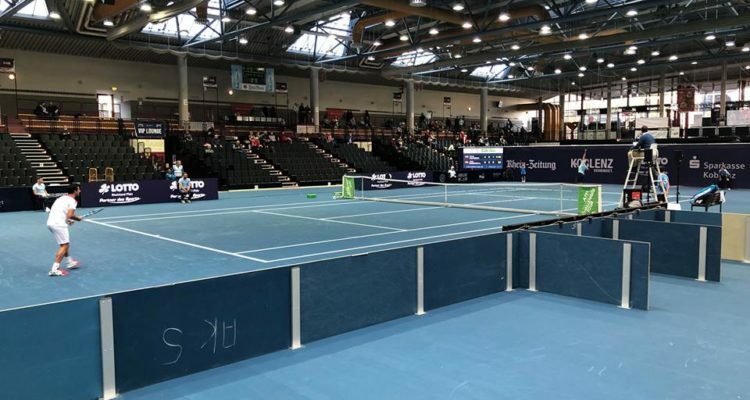 Only unseeded players were in action on a busy opening day of the Koblenz Open, the lone ATP Challenger event held during the first week of the Australian Open. Wild card entry Johannes Haerteis got off to a good start fighting past Vaclav Safranek from the Czech Republic 7-6(3), 4-6, 6-3. The 22-year-old German, who is currently ranked on a career-high World No. 387, sent down seven aces winning 80 per cent of his first service points to seal victory in two hours and eight minutes. Haerteis will next face the tournament’s No. 11 Filip Horansky of Slovakia. José Hernadenz-Fernandez also had to go the distance to beat Evgeny Karlovskiy of Russia. The 28-year-old from the Dominican Republic withstood 14 aces breaking his opponent’s serve four times to secure a 7-6(7), 4-6, 7-5 win in two hours and 36 minutes. Next up for Hernandez-Fernandez will be No. 12 seeded Frenchman Kenny de Schepper. Some of the favourites at the ATP Challenger 80 event will open their title bid on Tuesday when World No. 178 Andrea Arnaboldi from Italy and No. 5 seed Daniel Brands will play their first matches. The tournament’s top seed is Norwegian young gun Casper Ruud, who lost in the opening round of the qualifying at the Australian Open to Henri Laaksonen, and awaits the winner of the encounter between ITF-entry Raul Brancaccio and German qualifier Louis Weßels. This entry was posted in ATP Challenger Koblenz, ATP Challenger Tour and tagged ATP Challenger Tour, Koblenz Open.